They grew popular in Australia eventually making their big break through in America in 1979 with the release of "Highway to Hell" which broke the Top 20 album charts. 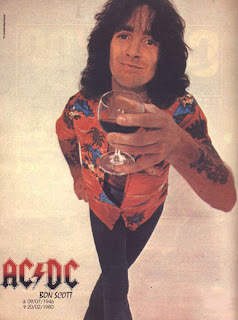 Scott is considered one of the great frontman in Rock & Roll history and a pioneer in the Hard rock/ Heavy Metal genre. On February 19th, 1980 Scott was drinking heavily at a London Club called the Music Machine. He was taken home but could not be awoken as he passed out in his friend Alistair Kinnear's car. He was left overnight to sleep it off. The next afternoon he was found lifeless in the car by his friend. He was rushed to the hospital but pronounced Dead on Arrival. The cause of death was alcohol poisoning & choking on his own vomit. He was just 33 years old. His body was cremated and sent back to his family in Australia. 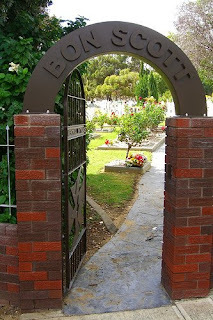 His ashes interred in Fremantle Cemetery and his grave site has become a cultural landmark & is reportedly the most visited grave in Australia. The band thought about breaking up but decided that Scott would want then to carry on. Angus & Malcolm Young met with Scott's family & they felt the same way & the band got their blessing to continue. AC/DC hired Brian Johnson to replace Scott and recorded the album "Back In Black". The albums all black cover was a tribute to Scott as was the songs "Hells Bells' & " Back In Black". The album is one of the top five selling albums of all time going 22 times platinum.